The penultimate race of the season is the home race of most participants of SimRacing United's GT Pro Series. It takes place in the south of Germany, on the Norisring to be precise. The Norisring is located in the middle of Nürnberg and it should be well-known to all fans of DTM or former German championship DRM. It is a short and tight street circuit, only 2.3 kilometers long and mainly consisting of one main straight, 2 hairpins and a dangerous chicane. We may expect a very, very close qualifying, lap times of less than 50 seconds and also a very close race. Overtaking is not easy, but a brave heart can help on the way to the first hairpin. A short look into the driver's standings: Alex Bräutigam leads with 34 points on Kevin Jäger which means, if Alex can take 2nd place in the race, he'd be the champion for the 3rd time in a row. But there might still be a lot of movement on positions 4 to 19 until the end of the season. 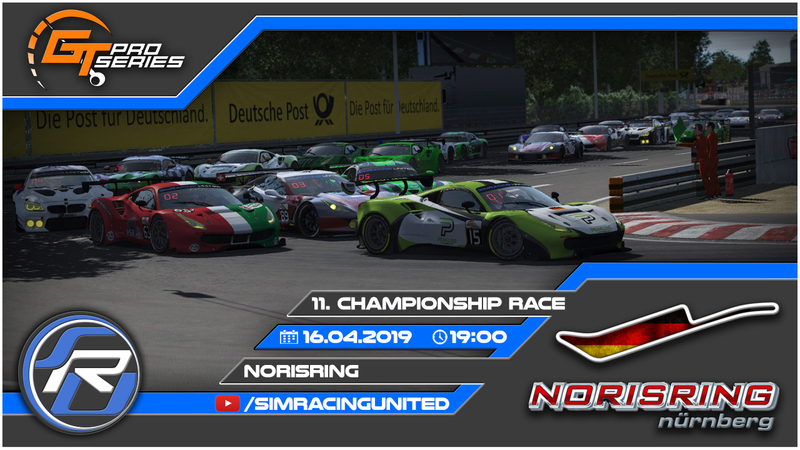 So tune in for the eleventh round of the GT Pro series / season 8 on April 16, 2019 from 08:00 pm.